A jumping spider from Central America eats mostly plants, according to new research. Spiders were thought to be strictly predators on animals. The spider, Bagheera kiplingi, was described scientifically in the late 1800s, but its vegetarian tendencies were not observed until the 21st century. "This is the first spider in the world known to deliberately hunt plant parts. It is also the first found to go after plants as a primary food source," said lead author Christopher Meehan. Meehan, now a doctoral student in the University of Arizona's department of ecology and evolutionary biology, discovered Bagheera kiplingi's herbivory while he was a student at Villanova University in Pennsylvania. Of the approximately 40,000 species of spiders known, Bagheera kiplingi is the only species known to be primarily herbivorous. Ironically, the vegetarian spider is named after the panther in Rudyard Kipling's "The Jungle Book." The spider inhabits several species of acacia shrubs involved in a well-known mutualism between the acacias and several species of ants. The ants live in hollow spines on the plant and drink nectar from glands at the base of each leaf and eat the specialized leaf tips known as Beltian bodies. In return, the ants fiercely guard the plants against most would-be herbivores. The leaf-tip structures are named after naturalist Thomas Belt, who published a paper about them in the 1800s. The B. kiplingi spiders are "cheaters" in the ant-acacia system, stealing and eating both nectar and Beltian bodies without helping to defend the plant, according to the researchers. Although the ants actively patrol the plant for intruders, the spiders' excellent eyesight and agility allow them to avoid the plant's ant bodyguards. The story of the first known vegetarian spider is also a story of cooperation, rather than competition. Co-author Eric Olson of Brandeis University had discovered herbivory in B. kiplingi in Costa Rica in 2001. In 2007, Meehan independently observed the same behaviors in spiders in Quintana Roo, Mexico, during a course taught by Villanova professor and study co-author Robert Curry. The two research groups subsequently combined efforts to publish the discovery. Previously, very few spiders had been seen consuming plants at all. Some spiders had been observed occasionally eating nectar and pollen, although the bulk of their diet was insects and other small animals. To verify the initial observations of the spiders' herbivory, the researchers documented B. kiplingi feeding behavior using high-definition video recordings. The team identified 140 food items of the Mexican spiders and found that more than 90 percent were Beltian bodies. For the Costa Rican population of B. kiplingi, only 60 percent of the diet was Beltian bodies. Those spiders were seen with animal prey items more often than were the Mexican B. kiplingi. Curry said, "What surprised us most about discovering this spider's extraordinary ecology was to find it on the ant-acacias. This well-known mutualism has been studied by tropical ecologists for nearly 50 years, yet the spider's role was not noticed until Olson's discovery in 2001. "We were lucky to find in Mexico an area where the spider is both exceptionally abundant and even more herbivorous than in Costa Rica," he said. The team also conducted laboratory analyses of the carbon and nitrogen in B. kiplingi spiders, other local spiders, Beltian bodies, and the acacia-dwelling ants. Analyzing the different forms of nitrogen and carbon in an animal can indicate its trophic level and its food source. B. kiplingi spiders were more similar in the nitrogen analyses to the herbivorous acacia-ants than to any of the other spiders sampled, suggesting the ants and the B. kiplingi were on the same level in the food chain. In the carbon analysis, which matches animals to their food source, B. kiplingi spiders and Beltian bodies were almost identical. Collectively, the data show that B. kiplingi spiders, particularly those from Mexico, obtain most of their diet directly or indirectly from the ant-acacia plants. Meehan and Curry suggest their finding shows that coevolution between an ant and a plant can result in the development of plant structures that may be especially vulnerable to exploitation by third parties that normally focus on completely different kinds of prey. B. kiplingi also exhibits signs of sociality. 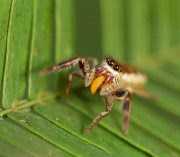 The researchers suspect that something about the spider's transition to herbivory has influenced the species' social evolution, a possibility the researchers are continuing to study.